INTRODUCTION: Liver biopsy remains the gold standard for the diagnosis of chronic liver diseases. Outpatient percutaneous biopsy is generally safe with a mortality rate of 0.17% and hospitalization rate for bleeding of 3%. Von Willebrand Disease (VWD) is the most common inherited hematological disorder with a prevalence of 1-3% globally. There are 3 major types of VWD – type 1 (low levels of VW factor), type 2 (several qualitative abnormalities of VWF) and type 3 (extremely reduced or undetectable levels of VWF with low concentration of factor VIII). Type 1 is the mildest and most common form of VWD, while type 3 is the most serious, but very rare. Whether VWD increases the risk of bleeding in invasive procedures is not known. 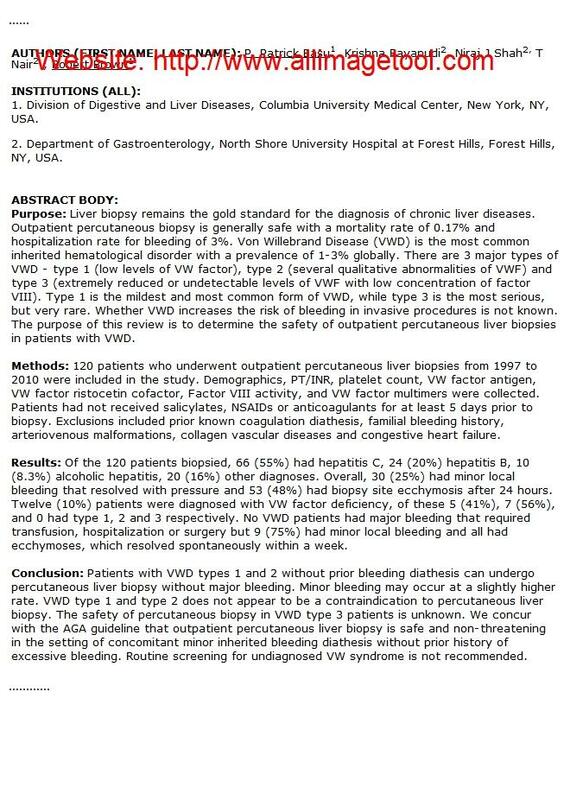 The purpose of this review is to determine the safety of outpatient percutaneous liver biopsies in patients with VWD. METHODS: 120 patients who underwent outpatient percutaneous liver biopsies from 1997 to 2010 were included in the study. Demographics, PT/INR, platelet count, VW factor antigen, VW factor ristocetin cofactor, Factor VIII activity, and VW factor multimers were collected. Patients had not received salicylates, NSAIDs or anticoagulants for at least 5 days prior to biopsy. Exclusions included prior known coagulation diathesis, familial bleeding history, arteriovenous malformations, collagen vascular diseases and congestive heart failure. RESULTS: Of the 120 patients biopsied, 66 (55%) had hepatitis C, 24 (20%) hepatitis B, 10 (8.3%) alcoholic hepatitis, 20 (16%) other diagnoses. Overall, 30 (25%) had minor local bleeding that resolved with pressure and 53 (48%) had biopsy site ecchymosis after 24 hours. Twelve (10%) patients were diagnosed with VW factor deficiency, of these 5 (41%), 7 (56%), and 0 had type 1, 2 and 3 respectively. No VWD patients had major bleeding that required transfusion, hospitalization or surgery but 9 (75%) had minor local bleeding and all had ecchymoses, which resolved spontaneously within a week. CONCLUSION: Patients with VWD types 1 and 2 without prior bleeding diathesis can undergo percutaneous liver biopsy without major bleeding. Minor bleeding may occur at a slightly higher rate. VWD type 1 and type 2 does not appear to be a contraindication to percutaneous liver biopsy. The safety of percutaneous biopsy in VWD type 3 patients is unknown. We concur with the AGA guideline that outpatient percutaneous liver biopsy is safe and non-threatening in the setting of concomitant minor inherited bleeding diathesis without prior history of excessive bleeding. Routine screening for undiagnosed VW syndrome is not recommended.